TIP# 1) Make sure you know what maximum width you will need to laminate, not just now, but in the future. Roll laminators are available as small as 12” and as large as 27”, so you will need to consider the widest item that you will be laminating. Remember that you will need to leave at least 1/4” of laminate around the edges of your document. Will a standard roll laminator width work for you, or do you need a wide format laminator for extra wide applications to 55" or more? TIP# 2) Ask yourself if you need to also be able to mount onto foam board. Many roll laminators have the capability to mount, however, you will need to check the specifications of the different models if this is a feature that you will be using. Some may only work with thin boards, while others thick boards up to 1". TIP# 3) Know the thickest laminate mil you will need to work with. Most roll laminators can laminate the maximum laminate available; 10 mil, however, it is always a good idea to double-check that your particular model will be able to handle the thickness that you will be using. Some of the less expensive models may be more limited in their ability to handle thicker laminate mils. TIP# 4) Think about where the laminator will go. How much space do you have, and how big is the machine? Will it need to sit on a stand, or will it go on a table top? Remember, for roll laminating machine you need access to both the front and back of the machine, so most users will place it in a central location of the room, or turn it sideways closer to the wall. 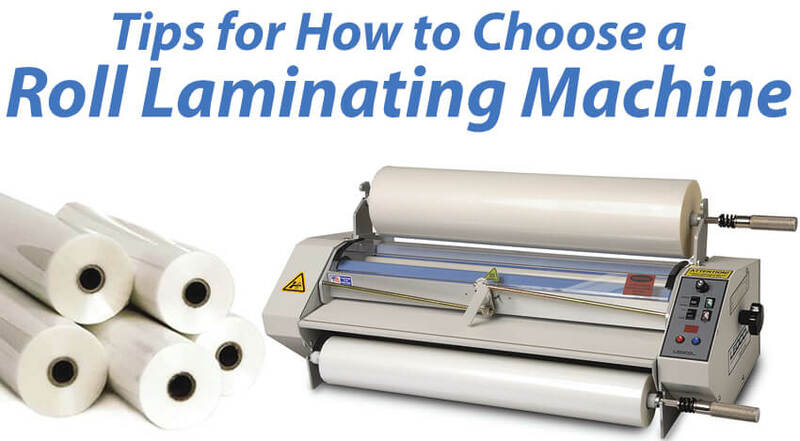 Laminating machines require a decent amount of space to be run properly. Keep your working space in mind when shopping, and remember to always ask for the machine dimensions before ordering. TIP# 5) Think about the potential users of the machine. Who will be using the laminator? Will it be only trained print shop workers, or will it be multiple office staff or teachers? Ease of use is important for many customers, especially those who will be using the laminator in environments with multiple un-trained users, such as schools or offices. If you are one of these customers, then you will want to confirm that the machine is easy to use and does not require special training to operate. Now let's quickly review the basics of roll laminating. A roll laminator is a hot or cold laminator that uses laminating film to encapsulate and protect documents larger than you would normally be able to accomplish with a pouch laminator. Roll laminating machines are designed for high volume runs as they allow for a continuous run of product or job. Roll laminators are perfect for laminating posters, maps, book covers, signs, photographs, charts, and much more. They allow for high production rates, are durable and built with heavy duty materials to last, and they allow applications to be wiped clean. Many roll laminators can also handle mounting documents onto foam board and other mounting boards; often as thick as 3/16” thick boards or more. Roll lamination is typically used for two sided lamination, completely encapsulating your documents in a protective lamination. In two-sided lamination, a top and bottom laminating roll are mounted onto the laminating machine with the adhesive sides facing each other. When the roll laminator is turned on the rolls are uncoiled and pressed onto the document. The heat and pressure applied then seals the lamination around the document, creating a protected and attractive finish. Lamination protects against spills, bending and tearing, and many films even protect against UV damage. Take a look at the various roll laminating machines that we offer at Binding101. What is most unique about our limited selection is that we have weeded out the lower-quality machines, so we only offer you a tested and 101 approved quality laminator. When you buy a roll laminator from us, you can feel confident that the "is this a good brand?" questions has been answered with a "heck yes!". Plus, we have some of the highest quality roll laminate film available as well, for an all over perfect finish.